How many times have you wished that you could go back in time and recover an item that was once deleted on your computer? It happens to the best of us: deleting a file or folder by accident, formatting and erasing a drive by accident, having a hard drive or other external media crash or get damaged, etc. It’s inevitable, accidents happen, which is why it’s always good to be prepared. Hard drives, both internal and external, are great for saving files and important data, but they can often fail us at unexpected times and leave us hanging. 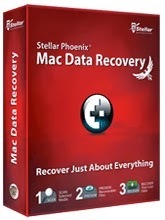 Luckily, there is software like Stellar Phoenix Mac Data Recovery available to help save the day. 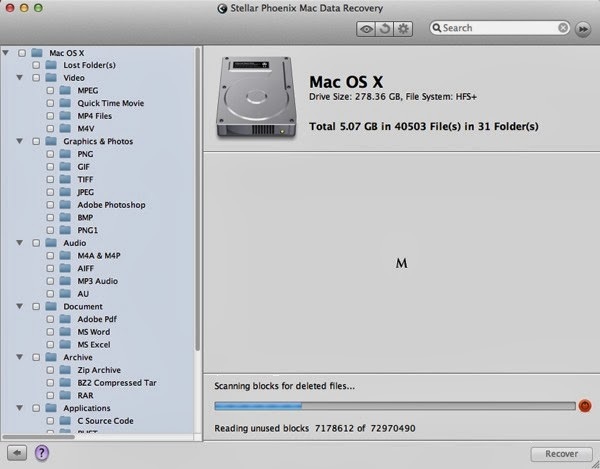 In this review, you’ll see what this application does and how it can help to recover lost files and important data on your Mac computer, as well as on external and optic media devices and even other operating systems that you may have installed on your Mac (for dual boot and triple boot systems). 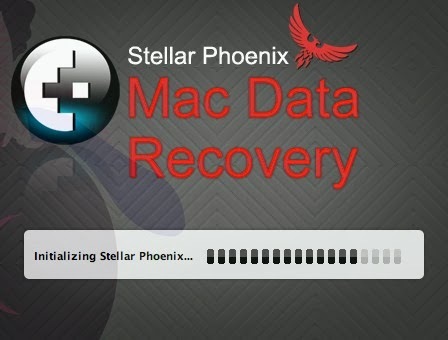 Stellar Phoenix is very easy to get started with. Once you unzip the folder and drag the item to your Applications folder, it’s pretty much smooth sailing. It does, however, take a few minutes for the the software to initialize when you first open it. Just be patient; soon you’ll see the main window and you’ll be able to start the data recovery process. The main window of Stellar Phoenix is clean and simple. In the top left corner there are four icons: Preferences, Register, Buy Online and About. I always like to go through Preferences myself, before using any new application, so it’s nice that it’s easily accessible here. In Preferences you can manually select the file types that you want to recover. If a file type is not listed, you can easily add it under the “Add Header” tab. Stellar can already recover more file types than you can even imagine, so you’re sure to be just fine with the default settings. Under the “Others” tab, you can check for updates and choose how often to automatically check for updates, if desired. You can also choose to hide partitions that are less than or equal to a specific size (ie. 512 MB). If you do not want to be able to see a preview of photos/text files found during scanning, you can keep it disable that here as well (it’s enabled by default). Recover Data - Use this option to recover lost documents, photos, music, videos and other important data. This is great if you’ve deleted a file or folder by accident, formatted and erased a drive by accident, deleted a volume, have a volume that has failed to mount, need to recover data from a remove storage device, etc. Create Image - This option takes a sector-by-sector image of the selected region. If you ever develop bad sectors that become unreadable, you can use this image to recover that data. Resume Recovery - If you’re in the middle of the recovery process and need to stop or get interrupted, you can use this option to resume. You will need to have a saved scan or image in order to use this option. 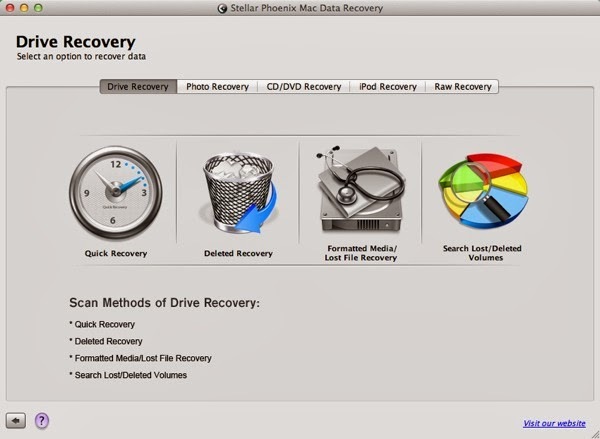 Once you click on the big blue “Recover Data” button on the main window, you have a few options: Drive Recovery, Photo Recovery, CD/DVD Recovery, iPod Recovery and Raw Recovery. Each Recovery option then has more options/steps to go through in order to begin the recovery process. At this point, it may seem a bit overwhelming when it comes to all of the options, but Stellar’s graphical interface makes it easy; it’s a breath of fresh air. Plus, there are helpful tips and explanations for each option, which walk you every step of the way. I also like that there are many recovery options to choose from. Stellar really can attend to all of your recovery needs, no other software required! Just for testing purposes, I initiated a Deleted Recovery under Drive Recovery, and I was pretty amazed at all that what found! All of my deleted files were presented in a very organized manner - grouped by file type. Plus, it’s very easy to recover items and you can preview them before recovering. There’s also a handy quick preview feature while the scan goes on, which lets you see recoverable items in real-time. It did take some time to perform the scan, but this is to be expected. If you need to abort the scan before it’s finished, just click the red power button to the right of the progress bar. You’ll be able to save the scan and continue it at a later time. The scan also uses a lot of battery power, so if you’re on a Macbook Pro or Air, you’ll want to be sure that you’re plugged in - this isn’t something you should do with just a few minutes to spare or if you can only use battery power. Advanced Boot Camp Support - if you have Windows or another operating system installed, Stellar makes it easy to recover lost or deleted data from those partitions as well. Recover data from NTFS and ExFAT file systems. Whether you Mac is a desktop or laptop, you can recover data even if your computer fails to startup - this is a pretty invaluable feature! 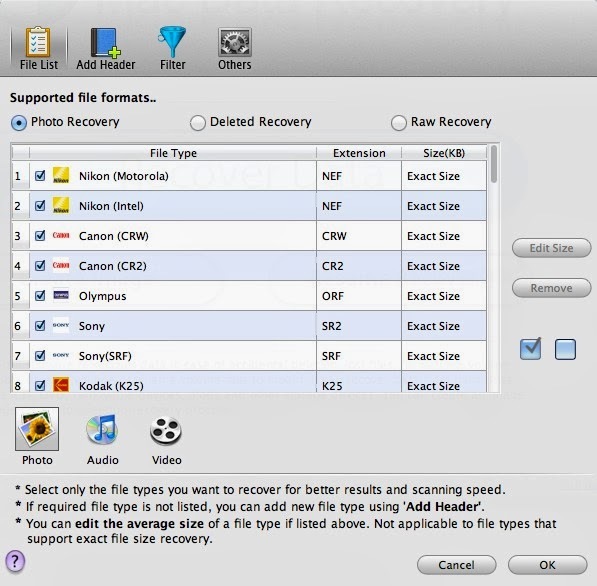 Recover data from optical media this is scratched or inaccessible, such as a CD, DVD, Blu-ray-Disc, etc. Even if there has been severe corruption, the “Raw Recovery” option can help you out. Recover data photos and videos from camera cards and external hard drives - even large drives over 2 TB. Recover volumes that have suddenly gone missing. Works with Mac OS X 10.4.11 and up. Includes 24-hour online support and a 30-day money back guarantee. 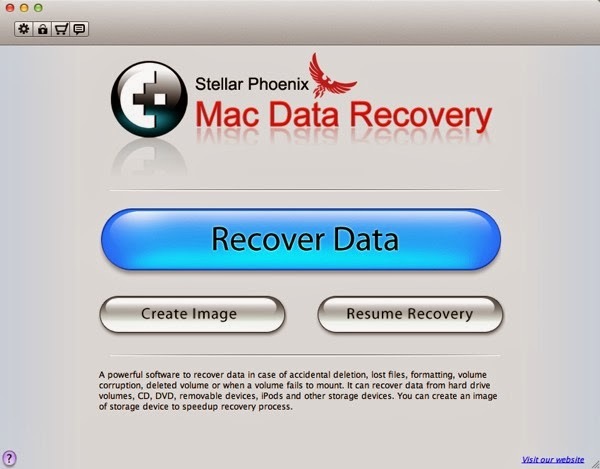 Stellar Phoenix Mac Data Recovery is a godsend when it comes to data recovery. Not only can it scan all known and unknown file types, but it can recover data from practically any type of external media as well. Calling this application a miracle worker is an understatement. It’s easy to setup, easy to use and navigate and is very effective - it definitely gets the job done. Stellar is free to try before buying, although the free version is a bit limited. You won’t be able to recover any data, but you can do all types of scans and see just how it works in that aspect. If you like what you see, it will set you back $99.00 for the full version, but as you can see from this review it’s well worth it. > USD Exchange Average Value per Bitcoin started this week at 180 after reaching the highest BEA week mark last week. But quickly jumped to 190 and then 200. Stood at 200 for some days and finally bumped up to 205. > Trezor, The Bitcoin Wallet Gadget got delayed until January. Promised new extra features to compensate. > A vocal minority of BitcoinTalk users accused Theymos of censorship and allowing scammy users into the forum. All points on the allegations holding truth to them. > It was pointed out that a loophole in Canadian law is what has allowed Bitcoin Startups to run fully unregulated. The Loophole being an interpretation of law technicism on how Canada defines a currency as the legal tender tied to a nation. To what Bitcoin just don´t fits into. > Bitcoin had their second biggest high on Google Trends since April of this year. Had already happened in early October, but the spike of this week is well over that one. > +Bitpay Processed their first 1 Million Dollars transaction. Making it the highest so far . This was for BFL hardware. Which is in itself also news. As there is someone crazy enough to do such a high order to BFL. But great news to the Bitpay guise nonetheless. > Robocoin Bitcoin Two-Ways ATM debuted in Vancouver, Canada at Bitcoiniacs to a roaring success. Generating a massive amount of live news coverage in pretty much every News Outlet in the USA and Canada even if just for a few seconds. But it also hit the news in many many more countries including China, Mexico, Australia, Russia and India. It even caused Cavirtex, Canada Virtual Exchange and LocalBitcoin Canada prices per Bitcoin to go up a little bit. The results of its media blitz ended with the Bitcoin ATM doing a whooping $40,000 Canadian Dollars worth of Bitcoin transactions in its first two days. What is more incredible about it. Is that its Buying/Selling price + Their fees gave you an Exchange Price Per Bitcoin result very much in line like selling or buying it with Paypal. But its Novelty, Convenience and Wow factors were just too strong, that such a detail became insignificant. > Norwegian Bitcoin Super Early AdopterJackpot Guy story was the second story to cause a media blitz this week for Bitcoin as it was also covered everywhere and even gave the guy his week of fame on his home country. It caused such a stir that it even generated copycats that claim to have found new acquired wealth with "previously lost by memory" Bitcoin Wallets. But without anyone of those providing solid proof. > The China Effect on Bitcoin was still the determining force this week when it came to not only sustaining the BAEP but also continuing driving it upward. Not the News Media Blitz of the Two Bitcoin Related Viral Stories Of the Week . With the proof being in the trading as BTCchina started to dominate several days of the week versus mt.gox and Bitstamp. And as Bitcoin engagement in China can be easily seen just by seeing how the Bitcoin Clients downloads from China continued to grow larger too. > Circle, A new Bitcoin Startup appeared on the scene with a flash of money as it raised $9M USD out of the gate from known investors. All points out it will be a Coinbase and Bitpay sort of competitor. > First Mexico City Bitcoin Meetup Took Place To Moderate Success. No, I didn´t attended. But maybe next time. > Trezor Had a controversial but good sale deal of 2x1 on November 1st. It was controversial because they just announced it will not ship until January 2014 and those that paid weeks ago just realized that their investment had just not only being delayed but had got effectively twice as expensive in theory. > UnSystem posted an IndieGoGo crowdfunding campaign for DarkWallet with a goal of $50K USD. They did so with a extremely well produced and executed video narrated and starred by Cody Wilson where they show what is their stance and how they really are a group able to call themselves Crypto-Anarchists and Cypherpunks, not at all in a figurative or metaphorical way. Which I respect very much since one is talking the talk and another also walking the walk. Within 24hrs it had already reached half of the goal. > London based Exchange CoinFloor opened for business. And with a flair that signal they could be big deal or just know how to make an entrance. Undecided. > Chamath Palihapitiya revealed himself as a Bitcoin Top 100 -- or Top 500 guy depending how you see things -- letting it be known he holds $5M USD worth of Bitcoin. > Bitcoin reached the news this week everywhere. Even in a prime spot of the Yahoo USA Homepage. > Life On Bitcoin Couple completed their travel around the world with Bitcoin. And with that, the Documentary Chronicling their 100 days living on Bitcoin going into its post-production phase. > Bitcoin Wikipedia Article was the second most read on Halloween. Which was CRAAZY. But the very best indicator of how big of a week this was for Bitcoin. > There is now a Google Glass Bitcoin App. > November 1st of 2013 was the Fifth Anniversary of the publication of Satoshi Nakamoto Bitcoin Paper. Now referred as Bitcon Conception Day. Which we did celebrated at the G+ Bitcoin Community. With Bitcoin Fifth Birthday being the 3rd of January 2014 with the release of Bitcoin as Software Code and the start of the Bitcoin Blockchain with what is now known as The Genesis Block. > Bitmit, went into a serious maintenance mode for what initially was going to be 6-8hrs. But that resulted in 16hrs of downtime on Sunday, November 3rd. The noticeable outcome appears to be a better site speed. Here is hoping it also translate in it going down less too. > BIPS announced that they have now integrated with Shopify to bring their Bitcoin Payment Solution to the 70,000 Merchants using Shopify. This a mere week after it was known they were planning on it. As it was reported in the past BWNS. > CryptoLocker Ransomware Malware Devs released a new Hidden Decryption Website that charges 10 Bitcoins, $2250 USD at time of this writing for the service. Outrageous. This is a good time for me to remind everyone that this malware or other malware cannot affect you as long as you have a Disk Image of your PC backed up in an Offline HDD or in Not-Synced Cloud Storage. Always try to backup every week. Every month at the very minimum. > It was known this week that a predecessor Ransomware Dev Group from Holland to what CryptoLocker is now doing was captured because they also ran a Bitcoin Exchange. Whole thing reads out of like an European Movie. BWNS banner graphic by www.MediaStormPro.com A Creative Digital Media Agency that accepts Bitcoin.